Lovely oceanfront condo with great views and great amenities. We've redone the outside, and decided to redo the inside also! Our latest renovation in 2016 was to update both bathrooms, with new fixtures, counters, and a larger shower in the master bath. The condo also features tile in both bedrooms, tile floors, beachy leather furniture, appliances, patio furniture to enjoy a great ocean view, and three LCD TVs with DVD players. Two comfortable, dreamy bedrooms: one king-size bed with adjoining bath with shower and private entrance to the tiled balcony. Second bedroom with 'twin over a full' size bunkbed and second large bath with tub. The queen size sleeper sofa sleeps two. Laundry facilities are across the hall. Condo is on the first floor with easy access to parking lot of this gated resort. The well-equipped kitchen has all items necessary to fix a picnic lunch or a gourmet dinner. Prepare fresh Carolina seafood in the spacious kitchen OR order a pizza to enjoy at the table for six OR, eat outside on the balcony while enjoying the view of pool and beach. 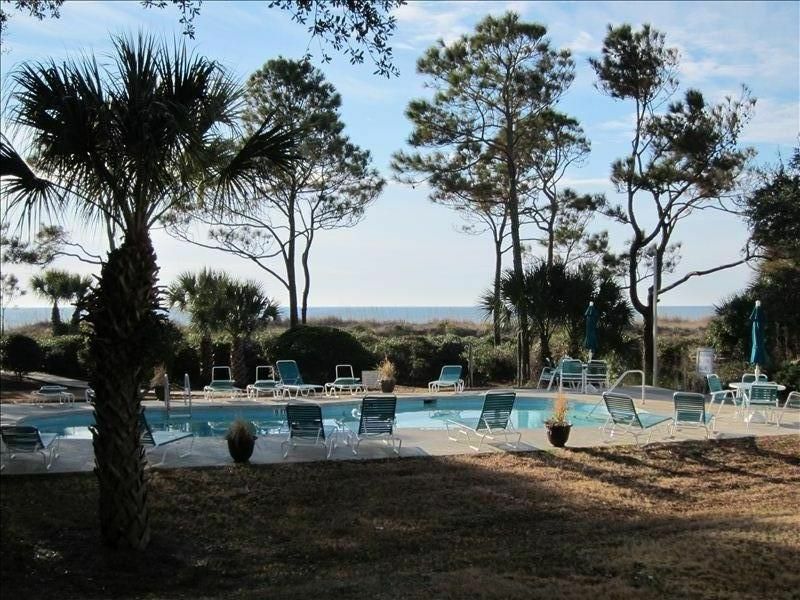 This beautiful, charming and comfortable condo is located right on the beach close to Coligny Circle. It is a prime location, on the bike path and within walking distance to two grocery stores, many restaurants and the fine Shoppe's at Coligny Plaza. This is a superb location for families or golfers! Six friends in land-locked Ohio, loving the beach and the area, finally decided to purchase our own place in Hilton Head. Hence the name--SIX ON THE BEACH. This property checked all our boxes-- proximity to the beach and ocean, and a smaller complex which means less crowds on our section of the beach. All of us had vacationed in Hilton Head for several years, so buying our own unit was not a hard sell! Our location is key--we can enjoy the beach AND we are within walking distance from several restaurants and shops. Two bathrooms, one with a shower/bathtub and one with a shower. These were completely renovated in January 2016. Split system. Three individual controls for bedrooms and living area. Split system. See air conditioning info. Sheets and pillowslips are provided in addition to blankets if needed. Kitchen and bathroom towels provided. Beach towels are not provided. Beachy decor with sleep sofa and two comfy chairs. (3) TVs are located in both bedrooms and the living room. A tall table with two chairs, plus additional seating is available with lovely views of both the pool and the Atlantic. The pool is located in front of our unit. There are some water toys in the utility closet to use at the pool. Location, location, location! We could see the ocean from our balcony! This was our first trip to HHI and using VRBO. We loved being steps from the ocean and Coligny Plaza. Unit was comfortable, kids liked the bunk beds and enjoyed having a pool nearly to themselves most days. It will be hard to stay anywhere else on future trips! Our family of 5 had a great stay. It is a great location, beautiful beach and comfortable condo. I highly recommend it! We enjoyed our stay at this property. There was 6 in our group and we had plenty of space. We loved how easy it was to get to and from the beach and how close local attractions were such as Coligny plaza and Harbour Town. We rented bikes and rode to Coligny and back several times for dining and shopping, that was a lot of fun. The beach itself is great, so quiet and calm right in this area yet plenty of people nearby one each side, you have the best of both crowds and quiet. We would definitely return. Thank you so much for your kind words--we appreciate your feedback. Could use some more pots and pans. Need additional blankets. Great value on the beach. We loved this cozy condo. As advertised, it is right on the beach and just a couple of building off of Coligny circle. The condo is in a great location walking distance to food, entertainment and beautiful private beach area. We found the unit to be clean and comfortable. We would definitely recommend this property to anyone who wants a quiet get-away in beautiful Hilton Head Island. Occasionally we will rent for less that 7 days during off seasons. Please call for a quote. Also, we have a winter special. During the months of December, January, and February, we will rent for 1500/ month.